Most of the time our adorable Mac is well behaved. At home he likes to lounge around, hunkered down beside us. Doesn’t he look so calm and innocent here? Well, during the holidays it’s a different story. All of the excitement tends to bring out the more naughty side of Mac. For instance, last Christmas I caught him chewing off the point of one of my favorite ornaments. And I must admit, this definitely upset me since I had no way of replacing it. The good part though…the more important part…is that Mac didn’t get sick from his chewing episode. Moving on…as I was walking over to the garbage to throw away the broken evidence, I noticed that the points of the star looked like mini Christmas trees…cute, little bottle brush ones. So, needless to say I hung on to the leftover pieces all year long. And just the other day, I reworked them into these itty-bitty things. 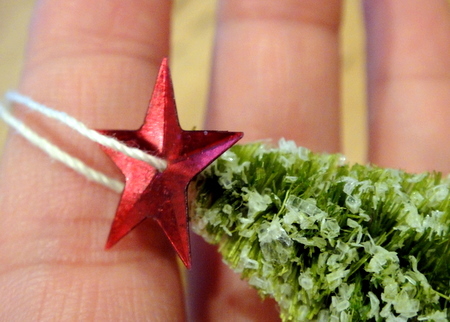 These tree ornaments are so tiny that they’re just a few fingertips long. I LOVE miniature things, don’t you? This lightweight ornament has a simple yet festive looking handle – the candy cane striped string sings a happy tune. 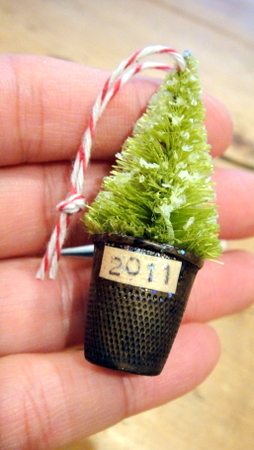 A vintage thimble makes the perfect base, and is just the right size for the teeny “2011” label. Here’s a close-up of the other one that I made. 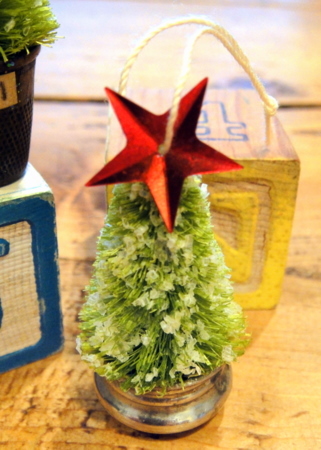 The rustic top of an old salt shaker makes for a charming tree base. Plus, it looks like a hefty bucket, grounding the entire piece. To dress up this tree I sprinkled on some mica flakes and artificial snow (used craft glue to keep the flakes in place.) Then I added a single star (slightly dulled down with Staz-On ink pad) onto a simple string handle. It feels good to take something broken and turn it into something new. I wonder what kind of trouble Mac might get into this holiday season. Whatever it is, I’ll be ready…with some glue, glitter, saved up spare parts and hopefully, a good attitude. you are inspiring, as always!!! This just made me laugh Becky…only because your Mac looks so innocent. You are so clever turning the damaged ornament in to the little trees. You now still have some of your original, special piece and a good story and holiday memories of your sweet little Mac. I wonder what ornament he will help you with this year? Our tree has lights but we’ve decided it will remain naked this year since Little Lucy is a climber and has been caught hanging out half way up looking out at us. We try to teach her, No, but it is kind of cute looking at those little eyes through the branches.., oh well, maybe next year she will have grown out of it! oh becky, THIS is what you do. Hmmm….I think Mac may have done you a favor. The ornament was very nice but these little trees are so very sweet! And as Rachel said – this is totally what you do! Trash to treasures indeed! Precious little trees, thanks to you and a bit of help from a precious little dog! Hope you have a happy December! I am SO glad you didn’t throw those away! The new ornaments are so super adorable! I love them! Love, love love these little trees! everything about them is wonderful! Oh come on! That is so stinkin cute! Back out to the store for thimbles tomorrow ….. You are so awesome! Mac is sooo cut, I bet you couldn’t stay mad for too log! 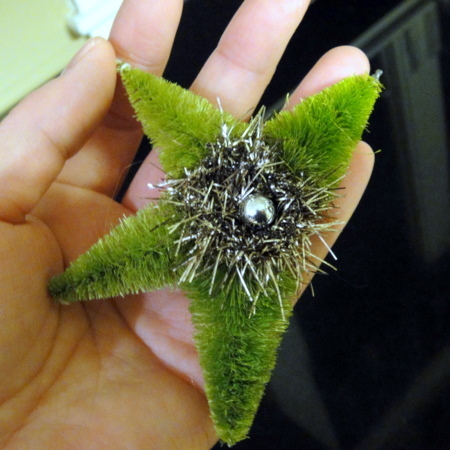 And he “inspired” you to make these beautiful ornaments! 🙂 I love what you did, the thimble and the salt shaker’s top are such a great idea and add a vintage feel to the ornaments. Wonderful, as always. Oh, Becky, sweet!!! And I’m so glad that the little naughty guy didn’t get sick. Oh, those eyes….they tell the whole story though! He looks so penitent! What a wonderful idea! 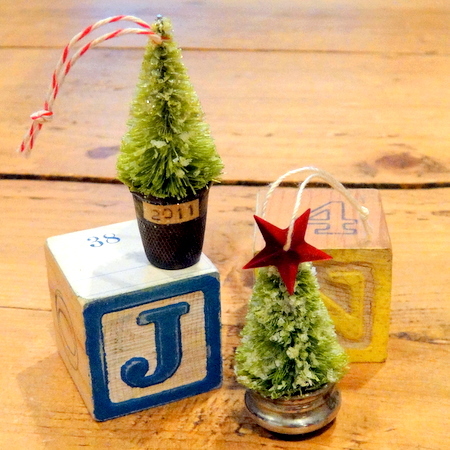 They are the cutest little trees and how lucky you saw that before they got pitched…. marvellous! Oh, Becky, don’t you feel virtuous when you come up with such a clever idea?? I love doing things like that; my long-suffering husband only shakes his head when I do it! Keep it up, that is a fabulous idea! I love the thimble and salt shaker bases they are gorgeous!! Awesome save!!! 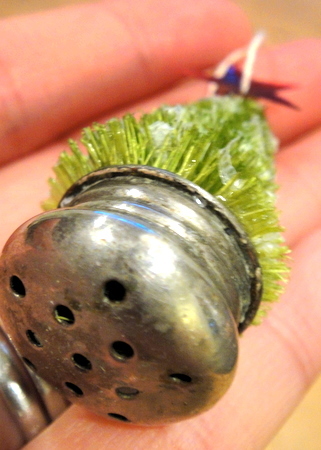 These are charming, I love how you used the salt shaker tops as bases, that is SO clever! Hmmm… perhaps Mac knew just what he was doing after all. 😉 The new decorations you’ve made are simple wonderful! I absolutely love these little mini’s. What a delightful way to repurpose a slightly damaged item. Oops! I am a saver of all good things as well and just love to repurpose items. Thanks for sharing your wonderful and beautiful items and ideas. I love how you save the fractured ornament and made new miniature ones~I love the little tree, especially the one with the star! Precious! That salt shaker top is just pure genius! Thank you for the lovely comments ladies. And I’m so excited to learn that many of you enjoy repurposing old parts too! This post was exactly what I needed this Sunday morning. 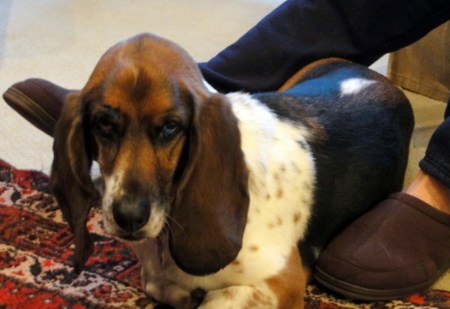 A fabulous dog with the most innocent (although I am convinced that innocent look is an act!) and how to find the positive from a negative. Then the ornaments. Full of Becky adorableness. You have a such a special touch. oh, love the ornaments you were able to make with pieces of your ruined ornament are awesome. love how tiny they are. love tiny things. the bases are very clever. and funny story about your dog. Just perfect, Becky! Silly dog! lol…Oh, Mac. 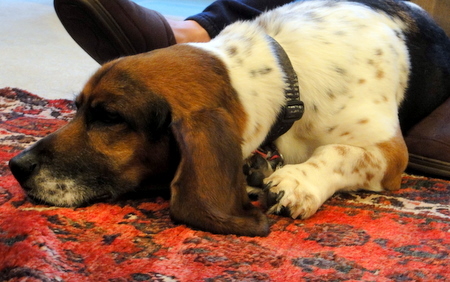 You are just like my two bassets. They are both well behaved and spend most of their time at our sides or on the couch asleep. However, they are extremely mischievous when you turn your back! Zoey has learned to open my glass closet doors off the studio and I come home to supplies that have been “heavily distressed” scattered all over the floor. Can’ t figure out how to keep her from using her paw to slide the door open! Today, I tried to sleep past 6:30 which offended them (it was breakfast time) so they teamed up and pushed open my closet door. I heard some bags crinkling and boxes being scratched on then they both shoot out of the closet with stuffed pumpkins in their mouths from the Thanksgiving decor I had not finished putting away. 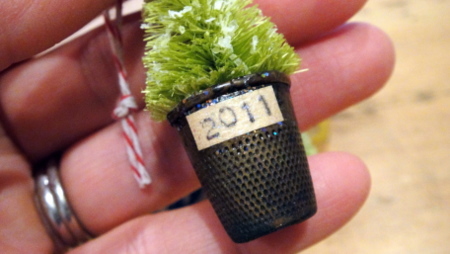 lol So glad you repurposed your ornament. They are adorable! While your original ornament was very pretty I love what you created from the leftover piece. Mac is sure a cutie. Thanks for sharing. heheheheeee…loooove these whimsical trees and their story!! It was also fun to hear all of the doggie doings that bring us joy even when they take some time to “clean” up. Thanks, as always, Becky for sharing your art! Your miniatures are perfect & so creative as always! Love the repurposed salt shaker top idea and tiny dated label. It looks like Mac did you a favor. You had one ornament and now you have several and they are adorable. 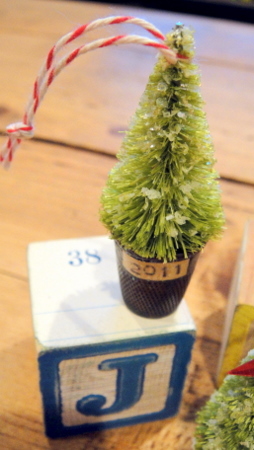 I love the use of the salt shaker top as a base for the tree. You never cease to amaze!